Many religions, in connection with the doctrine of the forgiveness of sins, speak about Grace of God. Allegedly, God, “out of love”, forgives man all his sins – all he needs to do is to sincerely regret and confess them. This attitude, however, mistakes God’s love for weakness and completely denies the Divine justice. According to the Law of Reciprocal Action, everything, good or bad, returns back to man. Nothing can be forgiven, but all must be paid until the last penny. As it says in the Bible, a good tree will produce good fruit and a bad tree will produce bad fruit, no matter we like it or not, whether we believe it or not. Let’s see how such “forgiveness of sins” looks like in practice. Man is thinking about what he’s done a couple of minutes and then he “regrets” his deeds. And thereby he considers the whole thing terminated. He does not try to make any effort to change his inner self. Why would he do it? After all, he was told to only regret and eventually to say a few prayers as a sign of repentance – and the Grace of God should put everything back in order. Such a pity is only a deceptive appeasement of conscience and has no real effect. Confessionals are still full of sinners and man does the same unpleasant things over and over again, often during his whole life.\r\nThe usual act of regretting sins does not work primarily because just then man deals with his past, although, recent acts; so basically he is thinking about how he was, not how he is. The bad personality traits that led him to the wrong doing and which must be removed, are still present in him, not in the past. The past is only a memory of our mind, not a tangible reality, in which we can feel and change anything. Therefore, man is almost always able to continue acting the same wrong way no matter he believes in “God’s Grace” and confesses. As long as he is not seeking the way to get rid of his personality flaws and instead of doing so, he is dealing with a “dead” past, he cannot succeed. Thinking about past acts is only good for better self-knowledge, so that we know how we are and what we need to change inside ourselves in the present. Excessive thinking and dwelling on the past would distract us from life in the present, keep us depressed from seeing who we once were and thus darken us even more. The real change must take place within us, not within our thoughts. Regretful thoughts are too shallow to touch the spirit and change something on human nature. If man wants to change, he has to feel the existing disharmony inside him in his heart. It is not enough to know that he acted improperly – he must imminently feel this improperness within himself. Feel so truly and deeply that he will never be able to do anything like that again, because he will feel disgust towards such deeds from the depth of his soul. Knowing the truth about what wrongful acting causes must be simply stronger than the sweet desire to sin. Only then is it possible to receive the gift of God’s Grace.\r\nEven if the promised forgiveness really worked, there would be still one more serious fact, which is, while relying on “all forgiving Grace of God”, often forgotten – man did not make the due amends for the damage he had caused by his misconduct. And that is the moment when real God’s Grace can be applied. In order to understand correctly in what the Grace of God consists of, it is necessary to be aware of the existing Divine laws, which determine the way how the forces in the Creation interact. According to one of these laws, only the forces of the same kind can affect each other. You are certainly familiar with the manifestation of this law in the material world: you cannot drill a hole into the water; you cannot bend the air with hammer thumps, you cannot catch the radio waves with a butterfly net; etc., because these elements have different nature. Similarly, this law is also applied in the spiritual realm, where it allows interaction only between forces of the same kind. Thus, any injustice, which would occur in the interaction between heterogeneous forces, is ruled out beforehand. Superior kind would always completely dominate just as if, for example, lightweight and heavyweight athletes or professionals and amateurs competed with each other.\r\nNow, let’s take a look at how this law applies to the human deeds:\r\nImagine two people who, long ago, intentionally harmed someone’s health. Let’s suppose that one of them realized the wrongness of his actions and changed himself; the other one, however, did not, and has even defined his actions as the law of the strongest, having considered them right. Regardless how he justified his own actions, the harm he has caused will return back to him. In addition to pain, mockery and limited life opportunities of the harmed person, there are also the worsened life conditions of harmed person’s family which must be added to the consequences of the harm. For example, due to the lack of funds, his children might be deprived from the opportunity of living their childhood fully, of having the desired education, which may bring another negative consequences charged to the account of the man who has caused the harm in the first place. And we cannot even imagine how many similar negative consequences are related to wrong acts. 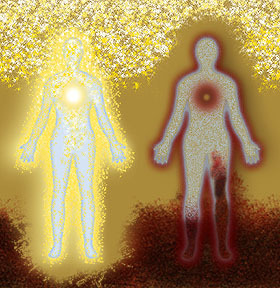 The harvest of human deeds is usually much greater than the seeds we sowed; in a similar way to the mustard seeds that give rise to several meters tall plants whose seeds grow into another and another plants.\r\nHow will the reverse effect of those deeds look inside such different people? The one who saw his act as wrong and changed himself to a better person is now radiating light and bright vibrations, to which heavy and dark vibrations, returning due to his previous deeds, cannot lean. The bad effects will hit him only with reduced force, proportionally to how much of the dark vibrations he removed from his personality. In case that no darkness is found inside him, the bad effects will just miss him. Unlike him, the man who did not change himself will be hit with full force by the returning effects of his erstwhile deed, because these returning dark vibrations will find inside him full support for their activities. The effect will be huge and the man will probably end up in a wheelchair. Alas, if he has not managed to realize what his behavior had caused and continued to act ruthlessly! He must experience himself the harm he caused to others. The Law of Uniformity protects people from unnecessary suffering by allowing encounters only between forces of the same kind. Why should the man who has already changed himself suffer for his past acts? It would not bring him any benefit. It would be only a sign of imperfection, which is excluded from the perfect Divine laws. Suffering is necessary only for obdurate people who are unable to recognize wrongness of their actions other than by experiencing the evil they caused for themselves.\r\nIf man is conceited, calculating, selfish, malicious, or has other dark traits within himself, his spiritual body will radiate the darkness as well. It will consist of heavy and dense vibrations and anything really good won’t be able to reach him. Conversely, man who is generous, friendly, noble-minded, well-meaning... will radiate gentle and light vibrations of bright vivid colors. He will be open to only equally bright and beautiful forces and anything dark will not be able to hurt him seriously. If such different people meet together, they will not find common ground easily. Therefore, everyone seeks intuitively his kind of people in accordance with the Law of Uniformity.\r\nGod’s Grace is never given to those who admitted their guilt, regretted their acts and wanted to change themselves, but it is given only to those who actually changed themselves. God’s Grace “recognizes” such man according to how he radiates. It works in perfect Divine laws according to how intense is man’s light or darkness, not according to what he thinks of himself. Thinking about wrongdoing does not make spirit bright and thus it does not prevent the effect of returning dark harvest. Only there, where the spirit is not surrounded by dark radiation, but where its robe is cleaned, returning effects of past bad acts cannot find any support and “forgiveness of sins” occurs. This is the way the Grace of God works in our lives. Even the greatest sinner can step up to the Light without having to worry about reverse effects of his past deeds crushing him down even if these effects were extremely huge. The Grace of God consists only in this – not in a go-as-you-please forgiveness of sins for which God’s Grace is incorrectly considered. In relation to the laws, in which the Grace of God applies, it remains to be said that whereas on one hand these laws help people to overcome the consequences of their bad deeds (so called “karma”), on the other hand they also work vice versa. If man falls spiritually and his astral bodies become dark and heavy, he thus stops returning effects of his erstwhile good deeds. Good effects will not be able to hold on to dark vibrations just as effects of his bad deeds would not be able to hit him when he changed for the better and radiated brightly.\r\nThe Law of Uniformity and the Law of Reciprocal Action lead us back to the life in the present, and the Grace of God is given to us as a huge help on our way to the Light. It does not matter what was in the past, but only how we behave now matters. Who we are and how we radiate can not be pretended or obtained otherwise than by honest work on ourselves. Knowledge that our past faults, even the worst ones, do not stand between us, and the Light opens the way to the Light for everyone who is willing to find out what they are doing wrong and to do their best to change themselves. The Grace of God will assist them.